Mod The Sims - Big Brother Challenge - Sims Style! Sim Adaptations - Big Brother Challenge - Sims Style! Replies: 349 (Who? ), Viewed: 124428 times. #1 11th May 2011 at 8:37 AM Last edited by justJones : 7th Feb 2014 at 10:47 PM. Big Brother Challenge - Sims Style! Many are familiar with the Big Brother show formula. 10 random strangers are locked up together in a house and at the end of each week the least popular person is voted out. The winner is the last person left in the house. But how would it work for sims? 8 strangers (or 10 if you have the mod to allow more) are put into a house and left to their own devices. At the end of 8 or 10 sim weeks, the last sim standing gets to keep the house! Create 8 (or 10 if you have the mods the allow them) YA random sims with a mix of personality traits - you could even use premade sims with randomly selected traits to get a broad spectrum of personality traits. Ideally it should be a male/female 50/50 split. Of course you may doll them up as much as you want, after all you have to look at them! Build a single storey house with enough beds for all. To mix it up a bit throw in a double bed *forcing* bed sharing and the ensuing aggravation *muahahaha*. You may make your house as visually attractive as you like - or as hideous as you like. Money control is not an issue - you will need money to furnish the house and buy Task equipment. You may use social interaction mods for things such as autonomous woohoo. The sims must be totally autonomous and you must NOT interfere with their actions. If death occurs, tough! No sim may leave the lot unless it is part of a group task. If a death does occur, as in my current game, one sim set himself on fire within the first hour of arriving at the house, you may replace that sim if you wish. You may however make things more difficult for your housemates - The idea of the challenge is 'triumph through adversity' so some adverse conditions are encouraged. You may sometimes remove some facilities such as one of the showers or toilets on a temporary basis as 'punishment' for not cleaning toilets or showers. You may also disrupt sleep patterns by putting a stereo in the bedroom and switching it on. Removing one or two beds. Again 'punishment' is up to you. Weekly Tasks - These are guideline tasks, feel free to create your own or repeat them more regularly. Your only limitation is your imagination! The only rule is that there must only be one activity going on at any one time - sims are forced to either join in with it or do nothing. Week 1 - Painting Task - purchase enough painting easels for all sims. Leave in place for 1 sim week. Some sims will paint, some won't. The sim with the most skill gain wins 10 points. If it is a draw between several sims, that's Ok. They all get the 10 points. You must NOT interfere with the sims autonomy in any way, but you may remove the painting from the easel to allow a sim to continue painting if desired. Or scrap paintings if a sim wanders off from the easel. Week 2 - Athletic Task - Purchase enough running machines for all sims. Leave in place for 1 sim week. The sim with the most skill gain in Athletics wins 10 points. Same rule as above. Week 3 - Install a pool - same as Athletic task. Remove after 1 sim week. Scoring same as above. Week 4 - Free choice - Repeat one of the above tasks or invent your own. Darts, Foosball, put in a gardening plot (via buydebug) install a pond for fishing (with debug fish spawners) whatever you want. This week is designed to boost social skills - the sim with the best/most relationships with the other sims wins the points. You may also install a bar for this week. Week 5 - Music Task - Purchase instruments of your choice - piano, guitar, bass, drums - rules as above. The sim with the highest skill gain wins the points. Week 6 - Eviction Week! The sim with the lowest skills and the worst relationships is kicked out. Week 7 - Saturday Field Trip - Take all the sims to the park and see what happens. At supper time treat them all to a meal at Hogans - or if you play a world with a dive bar, let them loose there. Again this is a social experiment to see which sims gain the best relationships. to quit their jobs after one sim week. The End - which sim is the most skilled? The best liked? The most popular? This sim wins! It sounds like lot of fun to play this challenge, and I really have to test it out! The Saturday Field Trip - am I supposed to send them to the park every day for a week, or is that part of the challenge only lasting for a day? Week 4 - does the skill you choose has anything to do with the points they get, or is it only the relationships that count that week? And then a general question - after every week; have I understood it right if the best one should get 10 points, the worst one be kicked out and the others between just stay but getting no points? I'm going to try this! This sounds like a lot of fun! I'll try to take pictures and post my results. Week 4 - Sure, count whatever skill gain they get as well as relationships! Yes - the best sim of the week gets the ten points, the worst is kicked out and the rest of them get nothing. Playing this myself, I found that some sims managed to rack up a cooking level or two and other sims did not - so the sims with the least amount of total skill and relationship gain was kicked. Regarding cooking - you can be really evil and clear out any 'leftovers' from the fridge each night ..... if you want You can manipulate their environment as you see fit, just don't manipulate the sims themselves. Please feel free to use whatever timescale you'd like I look forward to seeing your results if you decide to give this challenge a try. 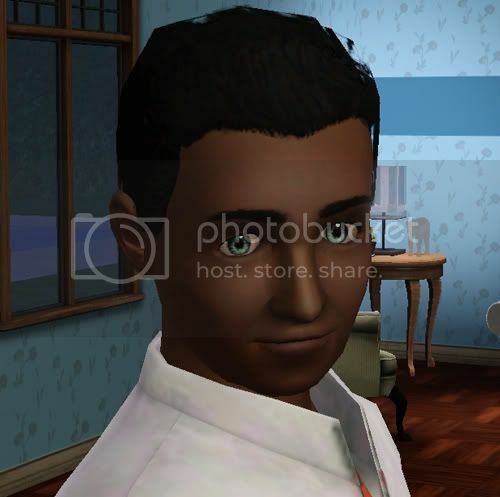 It is far, far harder NOT to interfere with your sims lives than one would think! Oh btw - you may want to cave in and buy a smoke alarm for the fireplace, with little else to do some sims wont leave the fire alone and ... well ... mmmm ... it's an accident waiting to happen! Good luck lady! Looking forward to seeing the pics and the results! Isn't it odd about the running machines? I had some sims use them and some ignore them. It's amazing what they will join in with and what they wont. This has been extremely fun for me so far! I ended up making the 2nd week a Logic week, and the 3rd week an Athletics week - treadmill and pool together. In order to get the Sims started with the Athletics skill though, I kinda forced everyone to go through one round of running on the treadmill. For the past 3 weeks, ONE Sim has been winning. Not too sure why cause his traits were rather quite a mix (Family Oriented, Couch Potato, Unflirty, Perceptive, Frugal). But he was ALWAYS the first to start and the last to stop for the day. Currently on my 4th week now, decided to move up the Music week forward before Socialising week. The week has been pretty frustrating cause really I dislike it when Sims stand around to watch their housemate play a musical instrument - they even skip on re-filling their needs and even autonomously cancel going to bed, just to watch (a Sim play in another room). So I've been actively cancelling all their "Watch" actions, sigh. The only times I'm actually "controlling" my Sims. Couldn't help it but to install fire alarms by the way! My fireplace has already caused a fire 3 times so far. The third time, the FLOOR caught on fire. The first two times, my Sims did. And I've also been clearing out all leftovers from the fridge. i think I am going to try this too! What a fun challenge! i am already doing this! Just one question! Are they allowd to call a NPC that repairs objects? Or do they have to do this there self? I'm definitely going to try this when I need a break from my current family! I love watching Sims do what they want; It's fantastic! Calling a service sim is Ok - and I suppose if they have been good boys and girls having a pizza as a reward for doing something epic might be allowed too! Week 6 it says you kick someone out. Doesn't that happen every week? Also, then the challenge should only go 7 weeks? Because week 8 would start with one Sim, who clearly wins and doesn't compete for anything or get evicted. I'm giving this one a try, with a few minor modifications. I'm going to base their success for the week partially on skill gain, but also partially on LTR points. Each week I will reset them all to 0 points and at the end of the week the winner gets a LTR. I thought this might be a good way to track their success since the sims who are happiest gain points the fastest because I'm not locking any wishes or using a mod that allows fulfillment of wishes without locking. I played for the first few days with a fire place, but after 4 fires and one death, I got rid of it. The only reason their was only one death was because I happened to have one brave sim who continually extinguishes everything while everyone else stands around screaming or faints. Jim died and I replaced him with Kyle. So far their have been a few arguments, a bit of chatting, a bunch of REALLY bad cooking, a bit of flirting and a lot of complaining about motives. I haven't added the easels yet as I want to play out a week of 'settling in'. ffordeffan .. room of death? eek! lol! I started in Pheasant Hollow, a mansion in Twinbrook with an industrial kitchen in the basement. So I decided to make the first task cooking. If I do this again, I'm going to get lower-quality items, because they'd eat once or twice a day and everyone cooked group meals, so mostly they were just eating what someone else cooked. I quickly decided to remove all leftovers between meals to force more cooking. Including spoiled ones, after having to stop a Sim twice in a row from eating bad food. ("It stinks in here. It's coming from that plate of food. If I eat it, the smell will go away.") And dirty dishes, after I saw a slob "lick clean" an empty plate and get full. Despite barely working on their assigned task and having no entertainment items, they didn't do too well at socializing with each other, either. Mostly they stood around staring at the decorative objects. Even the 3 of them who hated them. So I took most of those out, too. I haven't had a fire yet, but I installed fire alarms, because watching them burn down the house and possibly die in a fire is neither fun nor getting anywhere in the challenge. I'm still playing this game. I've discovered that Sims won't autonomously work on the following skills (unless, in some cases, they have the associated trait): charisma, writing, mechanical/handiness, athletic, martial arts, nectar making, photography, gardening, inventing, and fishing. They will swim by themselves, but I think they need at least a point of athletic to build it by swimming, so if you made them all take the athletic class and then gave them a pool, it might work. Cooking, instruments (I put out all the instruments and totaled their skill levels), painting, sculpting, and logic (chess boards and telescopes) have all been successful tasks for me. Hating art doesn't keep a Sim from doing well at sculpting or painting, oddly enough. I didn't try mixology, but I think it would work, which would make 6 tasks. Raising their cooking either by cheating or sending them to classes and then giving them each all the recipes to see who learns the most might work, too. Same with fishing books. I think they might fish on their own if you get them up to level 1. I haven't done the last week, careers, yet, but I'm thinking I might need to give them the same career so they have the same requirements to advance. And pick a job that requires skills they don't have yet or cheat to reset their skills. my only problem is the scoring system. Do you only evict after eviction week? Or do you evict every week, the loser of each challenge?